I know I haven’t done one of these in a while, it just so happens I haven’t played many inspiring video games lately – at least not ones that would make for a good P&P. Skyrim is fantastic, but a hill giant is a hill giant no matter where you are, y’know?. Granted the Necromorphs from dead space are basically “Space Zombies” but they are unique in their own very cool ways, let’s dive in! 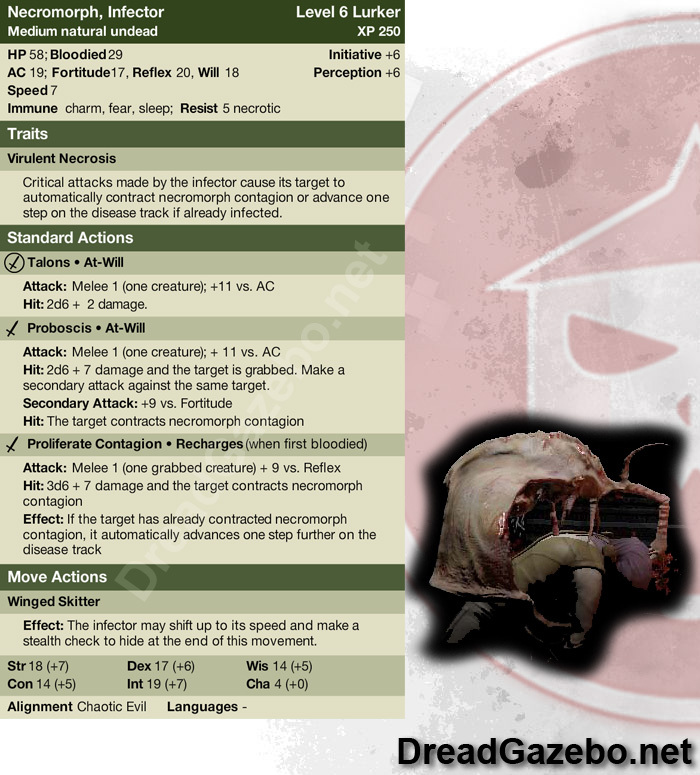 I’ve done up an Infector, they are disgusting little bastards who can quickly fill a room with shambling, stabbing Slashers (which I’ll be covering next time) by skulking along and infecting those left dead on the floor. Just one of these can make for quite a nasty encounter, especially if there are fresh corpses for impregnating. The Infector is a bat-like bundle of fleshy wings with claws, and a proboscis that protrudes from its ‘head’ used to inject and rapidly transform its victims into necromorphs. Once a victim is latched onto, a flail of tentacles burst forth from inside, devouring and turning its prey into a animated machination of flesh and bone. Infector’s prefer those already dead to those still living when searching for victims, often skittering around in the darkness and staying behind cover. After a victim has been transformed, the infector will quickly search for the next available target to transform until none are left, at which point it will attack PC’s directly, fighting to its death. [See An Example]. [titled_box title=”Necromorph Contagion || Level 6 Disease” variation=”green”]A flash of necrosis spreads quickly through the body, collapsing vital organs, snapping bones, and flesh until the victim has become a horrible undead abomination. Stage 0: The target recovers from the disease. Stage 4: The target dies and immediately reanimates as a Slasher Necromorph, it has hit points equal to half of the maximum hit points it had in life and enters the DM’s control. Check: At the end of each short rest, the target makes an Endurance check if it is at stages 1-3. 10 or lower: The stage of the disease increases by one. That is so awesome. I am totally going to steal that. I love using undead and turning people undead is even better. I’m glad you liked it, thanks for stopping by! Brilliant! How many times do adventurers sweep through a dungeon leaving dozens of dead bodies in their wake? Haha, nice! Sounds like a great time! Glad you enjoyed the monster and thanks for stopping by. I”ll have the Slashers up soon so you can see what they transform into.